Matt Adams - Superheroes, Sci-Fi, and a Touch of the Fantastic: New Antho Now Available! 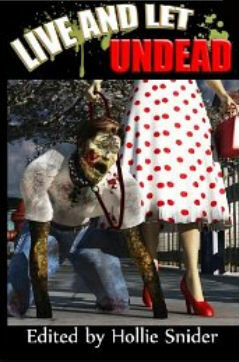 Live and Let Undead is now available on Amazon.com! This anthology was spared by Library of the Living Dead Press. Two others, Attack of the 50FT Book and Beta City, were cancelled. I'd signed the contract for a story in 50FT and had a hold request for a story for Beta City. Zombies aren't exactly my thing, but this antho gave me a chance to stretch my writing muscles a bit. I didn't go for the typical brain-eating zombie in my story, instead writing about a zombie trained to detect bombs and other hazardous materials coming through our ports. Harris and his bomb-sniffing partner Sparky work to stop biological weapons and other dangers from going through the nation's ports. Trained to detect hazardous materials, Sparky--an UNDEAD (UNnaturally DE-evolved Anthropological Degenerate) who used to be human--proves his ultimate worth when confronted with a massive, potentially catastrophic weapons shipment. You can get the anthology through Amazon.